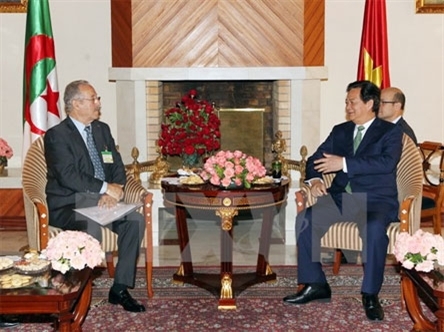 Prime Minister Nguyen Tan Dung received President of the Algeria-Vietnam Friendship Association Cherfaoui Tayeb on June 2 within the framework of his official visit to the African country. The Vietnamese Government leader bphasised that the bilateral traditional friendship and cooperation has been consolidated and developed continuously in numerous fields, but it has yet to match the two countries’ potential. He suggested both countries exert more efforts to speed up the implbentation of cooperation programmes and projects in order to enhance the relations, for the interests and aspirations of the two peoples. Speaking of the association’s operations, the PM affirmed that the association, together with the Vietnam-Algeria Friendship Association, has contributed positively to the bilateral time-honoured relationship. He hoped that with its role as a bridge linking the two nations, the Algeria-Vietnam Friendship Association will better its operations and work to boost cooperation between the two countries’ enterprises and people. Cherfaoui Tayeb told the Vietnamese leader that with the support of the Vietnamese Embassy in Algeria, the association has organised a lot of promotion activities for enterprises. The association wishes the two Governments continue creating favourable conditions for the association to organise more programmes and projects connecting businesses for the interests of both side. On the same day, the Vietnamese PM received President of the Algeria Vovinam Federation Djouadj Mohamed.